These are some of the most mind and life transforming truths ever communicated by God our heavenly Father through His Apostle Paul: Ephesians 2:4-10 and Colossians 3:1-5. This is the truth that will set us free. Free to be what God would make of us. What do these passages show us? We died to transgressions in which we were once dead. Ponder that. A reality. We are spiritually with Christ in the heavenly places, seated there by God the Father himself. A reality. 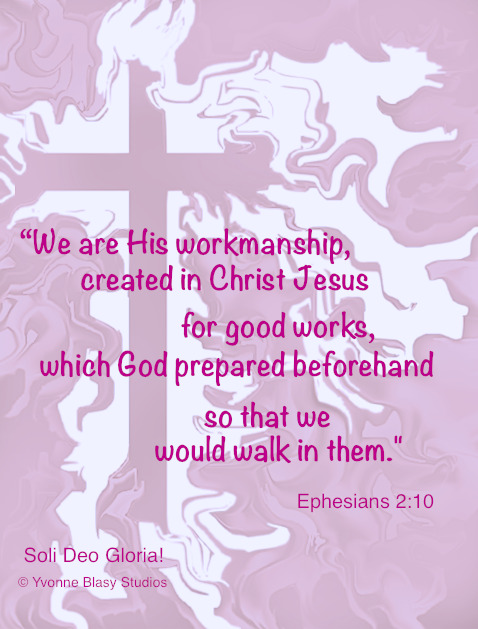 We are His workmanship, created anew through Christ’s incarnation, passion, resurrection, and ascension. A reality. He created us new in Christ Jesus to walk in His good works. A reality. "But God, being rich in mercy, because of His great love with which He loved us, even when we were dead in our transgressions, made us alive together with Christ (by grace you have been saved), and raised us up with Him, and seated us with Him in the heavenly places in Christ Jesus, so that in the ages to come He might show the surpassing riches of His grace in kindness toward us in Christ Jesus. For by grace you have been saved through faith; and that not of yourselves, it is the gift of God; not as a result of works, so that no one may boast. For we are His workmanship, created in Christ Jesus for good works, which God prepared beforehand so that we would walk in them." Ephesians 2:4-10. Since this is so, we keep seeking the things above where we are raised up in Him. Ask and keep on asking, seek and keep on seeking, knock and keep on knocking. The promise: “So I say to you, ask, and it will be given to you; seek, and you will find; knock, and it will be opened to you. For everyone who asks, receives; and he who seeks, finds; and to him who knocks, it will be opened. Now suppose one of you fathers is asked by his son for a fish; he will not give him a snake instead of a fish, will he? Or if he is asked for an egg, he will not give him a scorpion, will he? If you then, being evil, know how to give good gifts to your children, how much more will your heavenly Father give the Holy Spirit to those who ask Him?” Luke 11:9-13. Look up, learn by heart, and pray according to Ephesians 1:15-23 and Ephesians 3:14-21! The Holy Spirit answers these prayers by implanting in our inner being the vision God has for us in Christ Jesus. As He answers, we can begin to see, to perceive, to comprehend. It’s what we must have - His vision for us! “Where there is no vision, the people cast off restraint; but blessed is he who keeps the law. A servant cannot be corrected by words alone; though he understands, he will not respond.” Proverbs 29:18,19. Book learning of religious facts or history - even though we understand and give mental assent to it - is insufficient to bring any lasting change; words alone do not correct God’s servants. There must be a divine vision - a revelation - to the inner being, supernaturally imparted by the Holy Spirit, to commence this work of making real on earth what is in Heaven. We set our mind on the truth that is above - not on the earth, in spite of what goes on here on earth. We are in the world but not of it, radically so. We have already died in Christ and our new life is hidden with Christ in God! So our business is to be about manifesting on earth, through faith, what already is in heaven. Not only are we in Christ, but He is in us - “the mystery that was hidden for ages and generations but is now revealed to His saints. to whom God has chosen to make known among the Gentiles the glorious riches of this mystery, which is Christ in you, the hope of glory. We proclaim Him, admonishing and teaching everyone with all wisdom, so that we may present everyone perfect in Christ.” Colossians 1:26-28. When Christ our very life appears, we too will be revealed with Him in glory. Therefore we are to regard ourselves and our bodies dead to sin - immorality, passion, evil desire, and greed. These are idolatry. "Therefore if you have been raised up with Christ, keep seeking the things above, where Christ is, seated at the right hand of God. Set your mind on the things above, not on the things that are on earth. For you have died and your life is hidden with Christ in God. When Christ, who is our life, is revealed, then you also will be revealed with Him in glory. Therefore consider the members of your earthly body as dead to immorality, impurity, passion, evil desire, and greed, which amounts to idolatry. Col 3:1-5. We are dead to the old Adam nature which has been supplanted by that of the new Adam Christ Jesus. The Holy Spirit is poured out on all flesh, is available to all. Praise God for this magnificent plan, vision, and gift of salvation. “It will come about after this That I will pour out My Spirit on all mankind; And your sons and daughters will prophesy, Your old men will dream dreams, Your young men will see visions. “Even on the male and female servants I will pour out My Spirit in those days.” Joel 2:28,29. See Acts 2. This is how it looks when what is in Heaven is made real on earth!